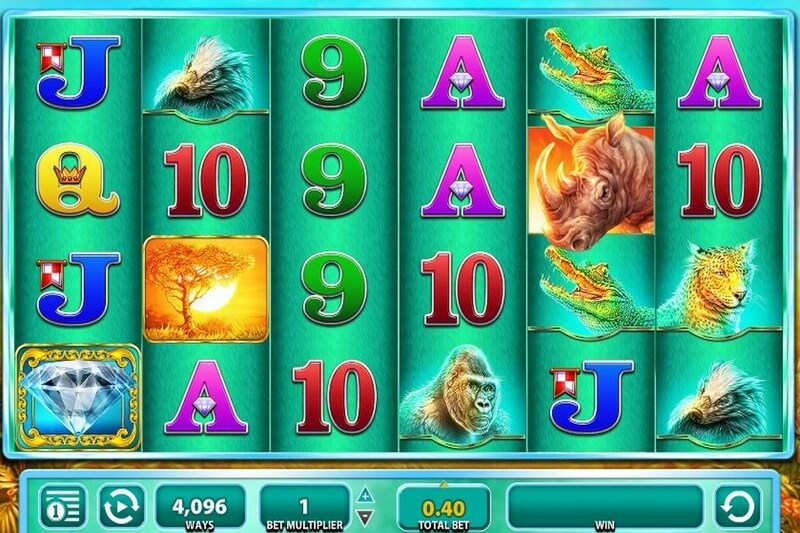 Slot machine game Raging Rhino takes you to the wild plains of the African continent, where the magnificent rhinos live. In Raging Rhino, you can enjoy a glimpse of some of the most unique animals of the savannah and each one of them can be your gateway to a handsome payout. If one paying line creates a match of 5 diamond Scatter symbols, the online slot game will pay a jackpot of 60.000 coins. The additional spins bonus guarantees to give players a min of 10 times of their total stake. If the feature is close to an end, but you still didn’t receive 10x the stake, it will automatically increase the payment in order to add the promised 10x bet to your balance. 95.91% is the expected percent of money that is returned to player depending on his wager. This, however, does not guarantee any winnings and is based upon a big number of gameplays online. The animal icons, such as crocodile, tiger, gorilla, and Rhino himself, pay between the max of 300 and 450 coins if you get a match of 5, depending on what are the landed slots symbols. 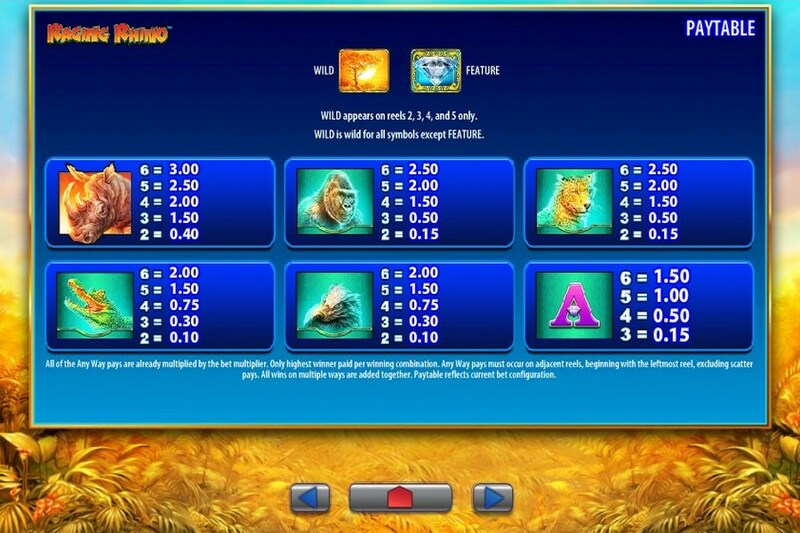 It takes at least 3 of them, or 2 + the wild symbol, placed at one win line in order to receive any payment. The same goes for the A, K, Q, and J letters, and 9 and 10 numbers, that pay maximum 150 and up to 225 credits. The Wild icon, seen as a tree upon the sunset, acts as any regular-paying symbol in the game except the Free Spin triggering one. 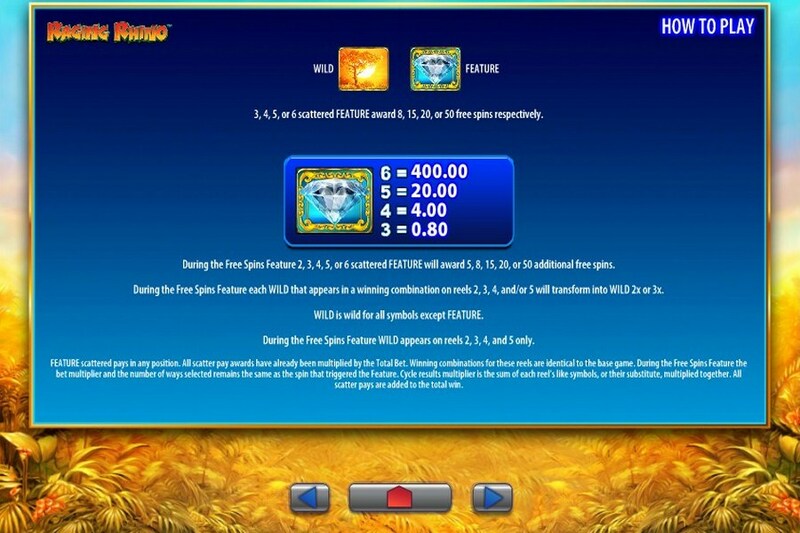 Wild will appear only on the 2nd, 3rd, 4th, and 5th reel during the additional bonus games. Now, it will transform into a wild/multiplier that doubles or triples every winning it is involved in. Both of them can be achieved with no download. Free Spins are activated once at least two of the Scatters are landed at any position on the reels. Once this happens, 5, 8, 15, 20, or 50 spins will start rolling at online Raging Rhino free slot machine. Nonetheless, during the feature, you have a chance of triggering even more extra spins. The only necessary button players need for setting a total bet and optimizing their profit is ‘Bet Multiplier’. 4096 is already a fixed number of winning lines, therefore, all you can do is manipulate the multiplier section between 1 and 150 by using the + and – signs. The total bet shows the cash/credits you bet per one spin. It is counted based on the pay lines and the bet multiplier settings. The Raging Rhino slot machine game has a massive 4096 winning lines. It has 6 reels and every single combination pays out. As you would expect, that means there are some big wins out there to be had, but also, some long losing streaks too. No need to download extra software, play games safely and fast right from your browser. You can try games for free or play with money to win real cash today!